Good Thursday all or like I to call it HAPPY FRIDAY EVE . Today we are going to review a book that is dear to my heart . THE HEARTS OF HORSES by Molly Gloss. Welcome to 1917 where a young woman is out in the west to gentle horses . When she rides up to a farm yard in Oregon . She is a young woman in a man's world . While the men are out fighting in the war she is out gentling horses . She has such a sweet tender way of helping the horses . There are more ways to break a horse then bucking the wild out of them . She becomes a good friend to the people that have hired her . 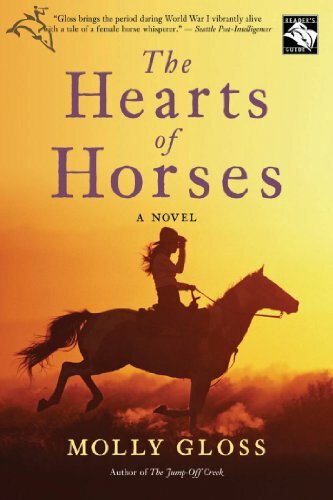 She rescues a team of horses and gentles a horse for a son who's dad is dying of cancer . She helps a family out and stands up to a hired hand that is an animal abuser . Along the way she falls in love and becomes a very big part of the community that she fought hard not to care for This book had me hooked from the first page . The author paints such a picture . The characters are so well written and complex . The main character Martha , I connect with her soo much . She is sweet but also strong , she really doesn't fit in anywhere. She is no nonsense and I would call her shy . She doesn't want to do the womanly stuff . She is a cowgirl and she loves horses . You really see her blossom through out this book . The familys in this book are such great characters . They all bring Martha to the realization that family is more then the people who are your parents . The Bliss's treat her like another daughter . They so sweet and kind and they grow to love Martha. Henry is such a sweet guy . He falls for Martha and slowly romances her . I loved Henry he is just so sweet and lovable . He is a no nonsense guy .